We have been winegrowers for 8 generations. On the death certificate of my ancestor born in 1704, it is written "Etienne Morin, professional winegrower". In 1880, Auguste Morin, my great-grandfather, had six ha of vineyards, which my grandfather, Marius, took over. In 1912, he left the vineyard for 2 years to carry out his military service and was then called-up in 1914 to fight for his country in the First World War. After 7 years of absence, and despite the work of his wife and his sister, on his return the vineyards were in a state of neglect and the war had had a profound effect on his morale. Marius and his family lived a modest life on the estate until 1922 when he decided to stop winemaking and joined Arbois wine cooperative. Over the years, Marius, my grandfather, sold a large part of his vineyard and advised his son against becoming a winegrower. However, in 1950, my father, Michel, decided to take over the estate... or what was left. 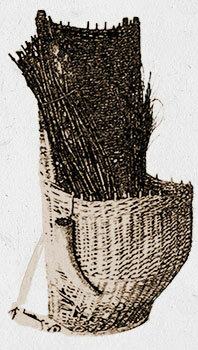 He also joined the cooperative and grew up to five ha of vineyards. His wife Monique supported him in his project through the income from her outside employment, and throughout her career she saved most of her holiday to organise the grape harvest. In 1985, I decided to join my father and like him, I joined the cooperative. I started out with 30 ares of vineyards and the estate has since thrived; I now have 15 ha. In 2009, I decided to leave the cooperative and take the fate of my grapes into my own hands, from the vineyard to the bottle. I sold three ha of vineyards to fund part of my project, including the construction of a vat room in 2011, a cellar in 2014, and a tasting area in spring 2015. In 2016, my wife Héléana, quit her job as a nurse and joined the estate. La Touraize was the named-place that already belonged to my family in 1704. It was my grandfather's last vineyard with which my father began his career as a winegrower. 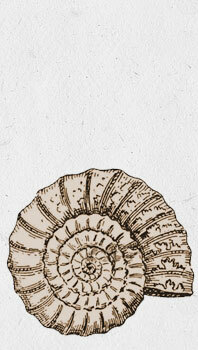 Why is the logo an ammonite? When I was a child and my father was ploughing a plot, I would follow the tractor to pick up any "nice stones" (ammonites) that were brought to the surface. It was like a treasure hunt for me, like a gift from the earth. When I created the estate, I was looking for a symbol, a logo, and my wife, who has always seen these "stones all over the house" suggested ammonite. 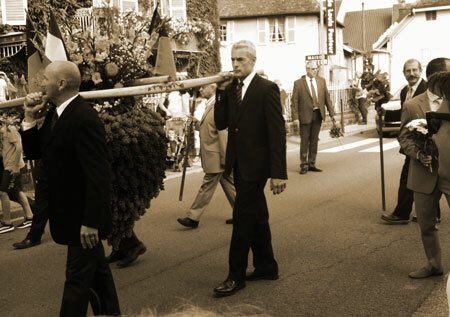 The BIOU is a celebration, an ageless tradition that no one who lives in ARBOIS or loves the town would miss. On the first Sunday in September, the winegrowers of ARBOIS offer the early stages of the upcoming harvest to Saint JUST, patron saint of the parish. The day before, the grapes brought by all the winegrowers within the designation are attached to a straw mould covered with wires to form the BIOU, a giant bunch weighing approximately 90 kg. 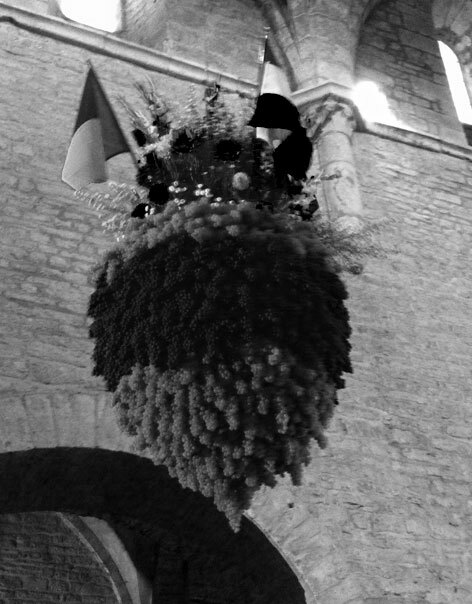 On the Sunday morning, four winegrowers carry the "bunch" hanging on a "stretcher" through the town to the church. There, the BIOU is blessed and hung from the church vault. Tradition dictates that when a carrier decides, they let the winegrower of their choice take their place. It is thus that after my grandfather Marius then my father Michel, I now have the honour of being one of the four carriers. After my grandfather Marius then my father Michel, I have the honour of being one of the four carriers.